Greg and I began our seven-hour drive north on the N3 highway that expands Durban to Johannesburg with the African sun warming our vehicle despite the crisp weather of early spring. In recent years, together and alone on our long drives, I enjoy reading aloud as we go. Greg and I share a wide range of interests; recently we’ve read such books as Long Walk to Freedom, by Nelson Mandela and Paul, Women & Wives, by Craig Keener. As we settled into this journey, we looked forward to beginning our next opus: The People’s Zion. This book, by Joel Cabrita, is a historical account of Zionism. It’s not about a national movement seeking a Jewish homeland in Israel, but rather the religious movement that began in our own homeland of Illinois, and what Joel calls Zion’s “transatlantic story.” We anticipate an exposition of the beginnings, and reasons, our ministry exists. I’d like to tell you more and will, possibly even again, as time goes on. The People’s Zion is available on Amazon. To view, click above. Raised in Swaziland, the author, Joel Cabrita has committed her life to a growing understanding of African beliefs. Dr. Cabrita was a University Lecturer in World Christianities at Cambridge University (see note below), specializing in the development of African religions. Dr. Cabrita was commissioned by the university to compile research for what has become, The People’s Zion, Southern Africa, the United States, and a Transatlantic Faith-Healing Movement. We met Joel in Zion for a discussion over lunch, in July of 2012. At that time Joel had just begun her research for this project. Since then she has spent considerable time on several continents, with Zionists. Living at Sunbury for a week, relocating again to Southern Africa for two years, and traveling regularly to those places unfolded by her research, Joel has ascertained testimony from “Zionists” of both North American and African descent. Note: This past June Sanford University’s, Centre for African Studies announced that Joel would be joining their faculty in the fall semester of 2018. Around the time that Dr. John Alexander Dowie was beginning his church movement in Zion, IL (see October 2017 post, “Who Are the AmaZioni?”) an African by the name of Isaiah Shembe began to gather followers in South Africa. “‘The Word,’ had come to him from God,” he said. And “he was anointed to save the African people.” This was the beginning of the Shembe in South Africa. The “spirit of Shembe” has been passed generationally to his successors. The amaNazaretha, the name Isaiah Shembe gave his church, was a million strong when disputes arose regarding Shembe’s successor in the 1980’s, and the amaNazaretha began to splinter. However, the Shembes are still known, alive, and continue to assemble in South Africa. Not as numerous as the Zionists, they have a similar zeal. Their hope is directed to Isaiah Shembe. “Shembe is the Way!” commonly adorns the side of taxis and bumpers on cars. We were recently privileged to be invited into an amaNazaretha church after Greg had preached at an engagement celebration for an amaZioni couple. Zion churches combined to celebrate the engagement, along with others from the surrounding community. “That’s ok. We want to hear the Bible. We like to learn from the Bible too,” was his response. Glad for our willingness, Mr. Ngcambashe indicated we could come to the early service at 9am or the later service in the afternoon. No all-night services for the Shembes, they have two shorter services that span the day, with a meal in between. Driving to our place of meeting, we wondered at what we anticipated would be a brand-new cultural experience, even after 25 years! Bombarded with surprised looks and pleasant conversation, the Shembe women soon recognized she was comfortable mingling in an African setting. The ladies welcomed her by taking pictures, asking questions, and they confidently replaced Carlene’s hat, with a colorful, African “indwangu” (singular) to tie around her head. Most of the amaNazaretha wives had ornate woven bands tied around white “izindwangu” (plural). However, izindwangu of any design is typical African attire; it was a welcoming gesture. After conversing with the men for a time, Greg followed as they moved toward the temple site. Watching, Greg observed each person kneel before crossing the threshold, “Senzani?” (What are we doing?) “We just kneel to pray for the service before we go inside,” was their reply. Greg considered their actions, knelt, and prayed silently that Jesus would be honored by our presence with the Shembe that day. The service was quite liturgical. 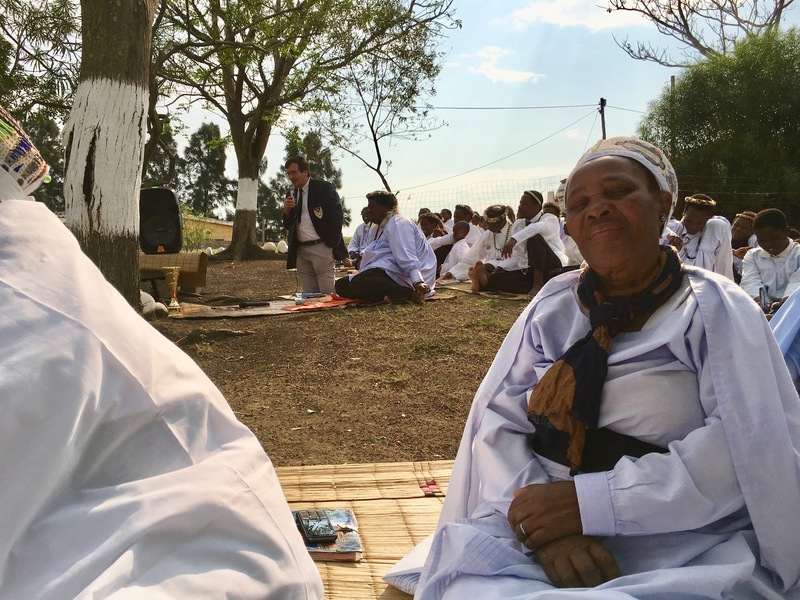 Congregants sang and followed an order of service using a book of Shembe songs and praises. First, an elderly woman spoke, and then the leader who intercepted Carlene. Everyone either knelt or sat on the ground. The leader explained that Shembes are intentional about keeping their heads low, “because we must keep ourselves low to God.” Though people were free to come and go as need be, there was little movement and no dancing at this service, such as we are accustomed to with the Zionists. From his kneeling position, the leader spoke clearly, probably more to the “abelungu” than to his assembled followers. He clearly explained, “God sent Jesus to the save the white people by setting Jesus among the Jews. But he sent Shembe to Africa, to save Africans!” He was careful to reference the Bible in support of his words; lifting up Shembe, he acknowledged God. Finishing his teaching, the leader invited Greg to “give a greeting.” Desiring to share more than a basic greeting, Greg requested permission to speak from the Bible. In respect for the Shembe people gathered that day Greg preached a 20-minute sermon from his knees. When Greg finished, the leader of this beautiful, gracious congregation of African followers of Shembe, raised from his seat on the ground, resumed his kneeling position as spokesman and thanked us for coming. He thanked us for being courteous to accommodate their African traditions and said, “If Madame had come wearing pants, I wouldn’t have let them in. But they arrived respectfully, and took off their shoes, ‘Not a problem!’ they said. I like their hearts.” Then he invited us back and insisted that Carlene take whatever pictures she would like of those assembled together. We transported Mr. Ngcambashe back to his home and gave him a tract that tells about our ZEBS schools. Do they really want to know the Bible? Who knows what God will do, and at what time? But we’re thankful, in awe, and privileged to watch and wait while He works. It is amazing what can be said when love and finding common ground is our focus. Unity in diversity, even in the face of opposing convictions, is a beautiful reflection of our Trinitarian God. It was a beautiful experience. We left that service, still wondering at what door God may be opening. Will they really invite us back again? Or was that just a kindly gesture, knowing it will never happen? Whichever, we were privileged to vividly experience that God can be lifted up without condemnation when love and humility is our common ground. PS. Be sure to take a look at our updated PRAYER REQUESTS, HAPPENINGS, PHOTO ALBUM, and OUR MINISTRY pages!